Florence, Italy is a work of art and these photos will blow your mind. Considered the birthplace of the Italian Renaissance, artists such as Michelangelo, Leonardo da Vinci and Botticelli decorated it's squares and museums with their great masterpieces. Thought to be Italy's most beautiful city, it is easy to understand why once you have strolled through it's streets and alleyways only to come upon an open square filled with statues and churches, cafés and stunning architecture. It's turbulent past saw the Medici Dynasty rise and fall, a monk burned at the stake and a brief stint as Italy's capital until it finally settled as the country's most visited city. We spent far longer than we expected in Florence and soon found ourselves relaxing into a pace of drinking coffee, examining architecture and enjoying the view. The sun sets over the Ponte Vecchio in Florence, Italy. It is worth the climb up to Michelangelo Park in Florence to snap a travel photo of the city at sunset. 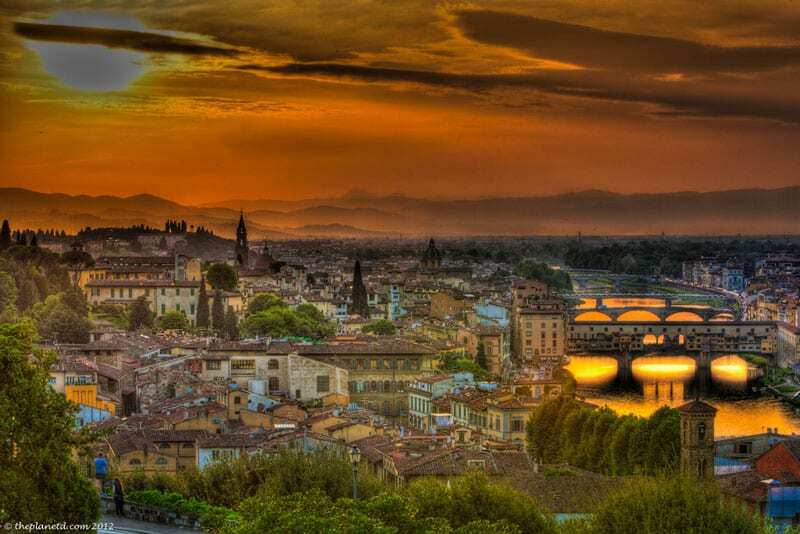 It is considered the best place for sunset over Florence and we agree. The Duomo in Florence is stunning in black and white. You have to wake up bright and early to capture a photograph of the Duomo without people. We were out on the street at 5:00 am and the crowds were already forming and the street sweepers were out in full force. 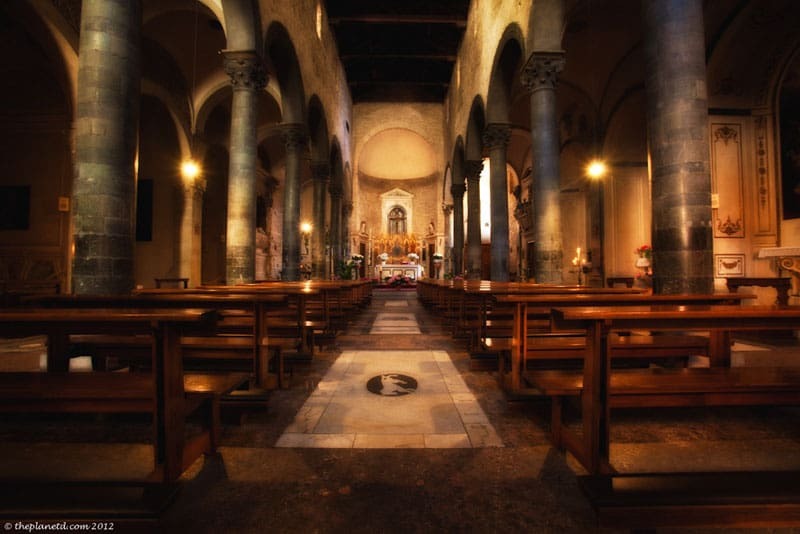 We took a walking tour of Florence with Walks of Italy to capture this photo of the interior of the Church of Santi Apostoli. If you wait long enough, you will find a serene moment of silence to take in the perfect photo of a Florence Church. Ponte Vecchio is the star attraction in Florence aside from David. Unlike many other bridges in Europe, the Ponte Vecchio Bridge was not destroyed during WWII. It is said that Hitler himself put an order out not to destroy this bridge. This may or may not be true, but one thing is for certain, it makes for a beautiful travel photo. Outdoor masterpieces can be found everywhere in Florence but the Loggia dei Lanzi takes it to another level. It's a beautiful open air art gallery housing various impressive statues. We had the good fortune of staying right in the heart of Florence. 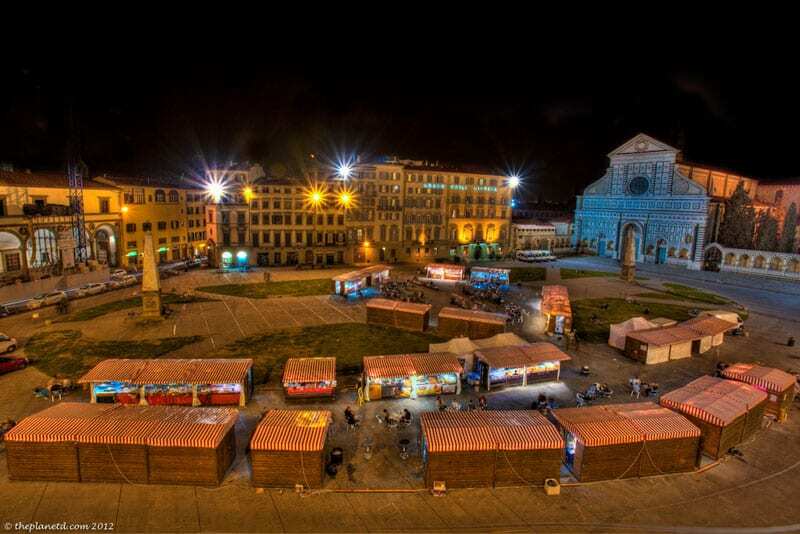 This lively square had an open air market where you could by meats and cheeses, bottles of wine and pre-made meals. The church of Santa Maria stands at the head of the square this is a photograph taken from our hotel. Definitely a room with a view. 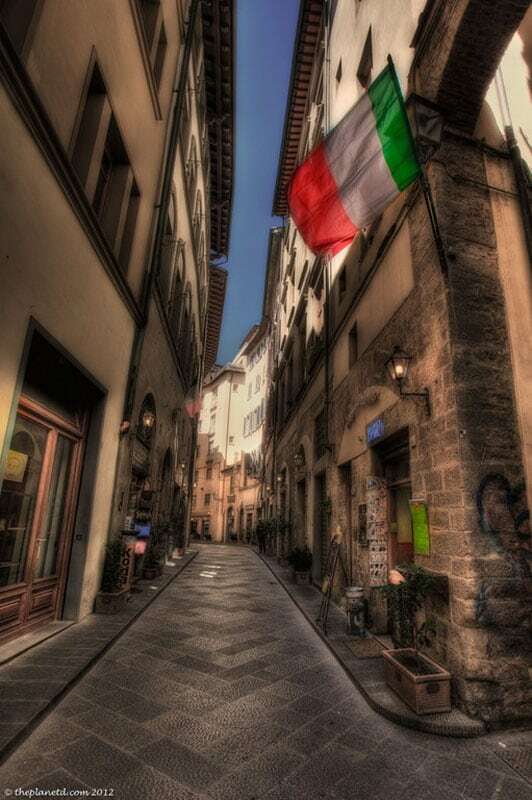 You can get lost walking through the streets of Florence, but that is a good thing. Getting lost allows you to stumble upon a gelateria or an Osteria. You may find an art gallery in the quietest of places or simply enjoy the daily life of the Florentines. No doubt about it though, you will see many an Italian flag hanging on a storefront window or peeking through a private home. The Duomo aka Basilica di Santa Maria del Fiore is the centerpiece of Florence. At 453 steps high, it is an imposing structure standing over the city. Completed in 1436, it was the world's largest at the time. To this day it remains the largest dome made of bricks. Florence is a travel photographers dream and one could get lost for days exploring its beauty and enjoying its history. Our travels to Florence only barely scratched the surface of this thriving Italian, city. « Lanai, Where on Earth is it and Who Owns it? 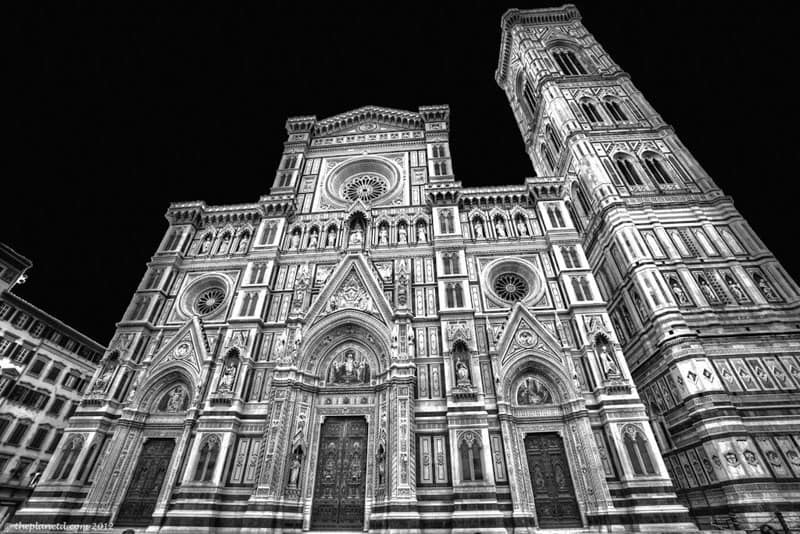 76 Responses to "Florence in Photos, A City of Art"
Love the black and white of the duomo! I didn’t think it was possible for Florence to get any more beautiful but you’ve managed it with these shots! Awesome! Thanks Turtle. We were extremely luck with great weather and gorgeous skies while we were there too. I’am Italian but I had never seen such beautiful pictures of Florence. That is a huge compliment Mr. Loto. Thank you so much. Florence is a beautiful city as are so many in Italy. Yeah Florence is such an amazing place to visit! I love everything about it but especially the architecture and the food. Mmm, the food. I love the food in all of Italy! Florence is one of my all-time favorite cities! I visited in 2010, but I had 33 students in tow during a school trip, and as group leader, I was a bit stressed and unable to casually meander the city at my leisure. I want to go back with just my husband and spend a lot of time immersing myself in the culture. Your photographs are stunning – well done! It is nice to see shots of Florence without a million tourists in the background as well. Feel free to check out my blog – I could use some photography tips from you experts! Wow! 33 students sounds like quite a handful. It’s so easy to get lost in the streets there, I’m impressed you kept everyone together. YOu are so right, it is difficult getting anything without tourists in it. But if you get up early, stay up late and get out of downtown it can be done:) Will definitely check out your blog. Cheers. I really liked Florence and just didn’t spend enough time there. I would love to go back. It is indeed a travel photographer’s dream. Florence is a fantastic city. I loved every minute I spent there. The Uffizi museum was stunning and I actually got to see the originals of Botticelli’s Birth of Venus and the Primavera…wonderful. While the bread was hard, the rest of the “foodie” experience was wonderful, with cheap wine, lots of rich pastries and braised beef, roasted pork and Pollo alla fiorentina. Making me hungry. Ten thousand scooters made it interesting to drive around and the narrow maze of streets will get you lost in time. The Ponte Vecchio was ok and I suppose worth seeing, but in a way a little disappointing in it’s shopping was mostly Gold Shops. The Michelangelo Hill was well worth the drive up for the view back over the city if I ever go back I want to Kayak down the river. Incredible pictures. Great city and always a pleasure to visit. I love Florence too. It us beautiful both in the day and at night. Thanks Christy. Did you manage to go above to take a look at the city. the sunset was spectacular that evening. Mamma mia, com’è bello! I have go back to Italy to visit Florence. Stunning photos! What filter are you using or are you adding a filter effect in Photoshop? Ah the Ponte Vecchio, I don’t think there is a more romantic bridge in Europe. Now I’d like to see it without all the crowds. We must go sometime in the winter. We’ll have to get Dave working on one. Maybe next year when our travels slow down he’ll finally have some time to get down to business. We’ll keep you posted. I have no words after seen your snaps. The photos are truly award winning. It is so nice and captivating. The timing of camera is amazing, that’s why photos seems to be real. You have an AMAZING eye! Keep up the great job! Looking forward for more of your works. Cheers! Wow! Thank you. I don’t think I’ve ever been called award winning before, I appreciate the compliment. What incredible photos, really captures the beauty of Florence. And good work getting up early to avoid the crowds and catch the light! Fab photos as per usual! Such beautiful shots!! Loved them all, Thanks for the virtual tour of one of the most pretty places on earth! Cheers Arti. Glad you enjoyed. 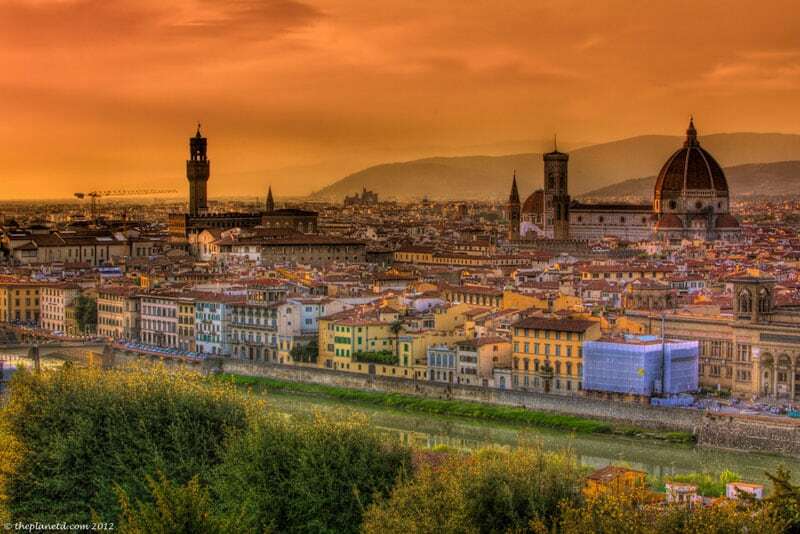 Yes, Florence can certainly be described as one of the prettiest places on earth. Well said. It’s hard to take a bad photo in Florence, but I also think the photographer loved the “Vibrance” feature in Photoshop too much, causing the photos to look unreal, and coldly blue. Hi Clayton, thanks for the critique, however I didn’t use the vibrance feature in Photoshop. These photos are HDR and edited in Photomatix. Cheers. Amazing photos as always – just gorgeous! I spent a summer in Florence and am now experiencing a serious case of “I need to go to Firenze now” syndrome. Haha, well said. Wow! An entire summer in Florence, I couldn’t imagine. What were you doing there? Studying Italian, art? just enjoying the ambiance>? sounds heavenly. 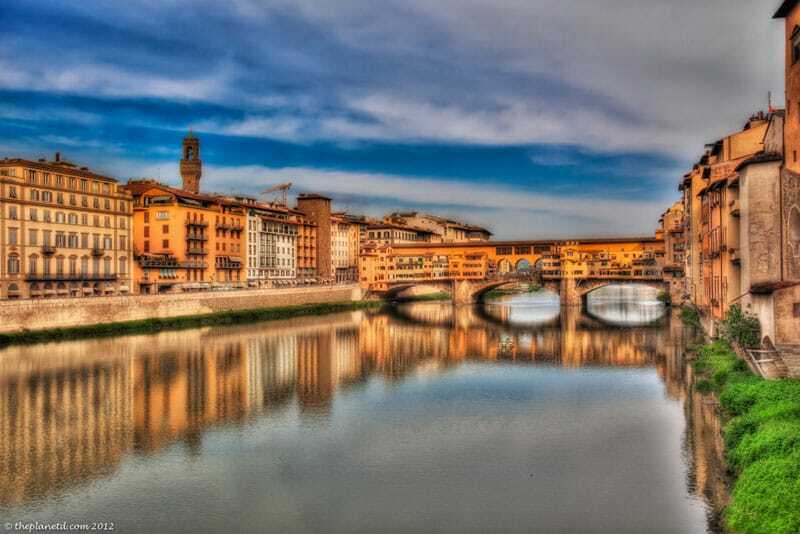 Gorgeous photos of Florence! We are headed back there at the end of the month for a totally different side of Florence – its fashionable side! Your photos are absolutely stunning! They make Florence look dreamy. Have you been on any road trips in Italy? One of our writers, Mattie Bamman has Florence as one of the top 10 places to take a road trip in Italy. After seeing these photos, it’s easy to understand why. We have driven through the Cinque Terre Region of Italy two years ago. We rented a car for a month and just camped our way along the Mediterranean. It was a dream and what a great drive from France. Seriously amazing photos! Florence has been on my list for a while, but your endorsement really makes me want to go! I love your glorious photos! Compliments! Fantastic shots! They make the city look so dreamy. Thanks Amanda, if there is one city that you can call dreamy, it’s Florence. I have always thought Florence was a beautiful city but your pictures have taken it to a new level! I feel as if I’ve strolled the city with you. These pictures are inspirational. Thank you Debbie, what a wonderful thing to say. If I can make people feel like they’ve been there, I did my job. Florence is a photographer’s dream. Florence just might be my favorite city, but I’m a bit biased because I studied there and focused on Renaissance art history for my B.A. Your photos show the city in a unique way. 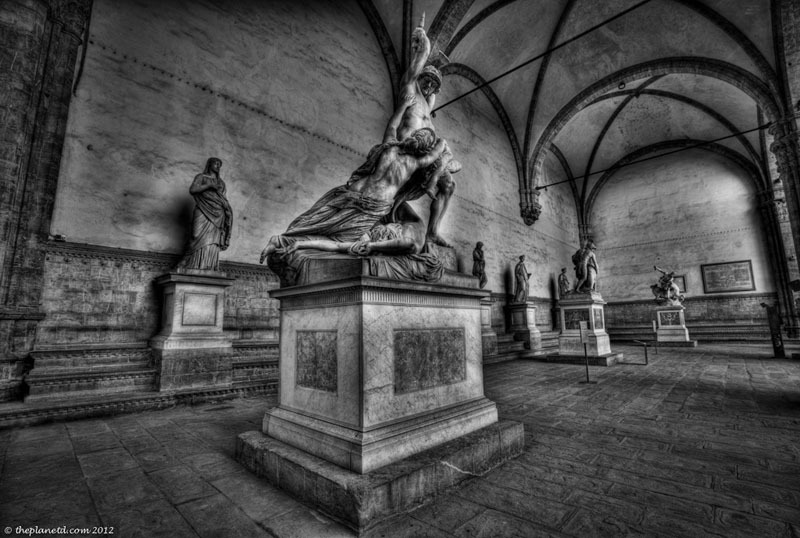 I especially love the Loggia dei Lanzi photo–such a cool place, and your photo of it is amazing! Wow! That must have been the most amazing education. You would be inspired every single day. Simply incredible! Even with the obligatory crane in the shot, that last one is amazing! Ah yes, you cannot take a photo of any city these days without a crane in it:) Thanks Miss Hogga. You’ve captured everything that drew me to write about Florence in my Go with Oh entry. I can’t wait for November when I get to experience all this spectacular city has to offer. Thanks for giving me such a wonderful preview. I’m in for a treat, don’t you think? Have a great time in November. I think that will be a great time of year, hopefully the crowds will subside. I absolutely love your photos!!! !I am a travel junkie and have been all my life. My husband worked in Florence for a while, and I consider it one of my top 5 favourite cities in the world. My husband and I enjoy traveling as much as we can (we unfortunately work full time). Photography is one of the best ways to showcase and show the beauty of the world we live in. I thank you for sharing. Hi Audrey, that is wonderful that you and your husband enjoy travel together. So many couples don’t. It’s always hard to fit in as much travel as we like, but the joy of working full time is that when you do travel, it is very special and you never take it for granted. Now that we are traveling more, we have to remind ourselves sometimes just how incredible the moment is. Don’t worry, we still love it, but like anything in life, when you dont’ have it all the time, you cherish it more. Enjoy your next trip! I love Florence! What an amazing city and your photos are brilliant. Thanks Jonathan, I can understand why so many people go to Florence and decide to never leave. These pictures are amazing! I love Italy, and I’d love to go back to Florence. The last time I was there was 1999! Such a great city, and so many beautiful things to photograph there. Wow, I wonder how much it has changed since 1999. I find that so many destinations have drastically changed in the new millenium. The world is shrinking and everyone is traveling. It’s crowded, but something tells me it was always crowded. One thing we noticed about the cities of Italy is that gentrification hasn’t set in yet. We dont’ see Starbucks, McDonalds, Gap Clothing and chain stores on every street corner. They’re creeping in yes, but they’re not everywhere yet. These pictures are so dream like. Florence is one of my top 3 or 4 cities I’ve ever visited and you’ve captured why here. It’s such a beautiful place to be, and I also found it so comfortable that I ended up staying a couple of extra days. You said it John, that is exactly what Florence is…comfortable. It doesn’t have the gigantic monuments of Rome or the quirkiness of Venice, but it has a comfort and elegance that keeps people coming back for more.